Statue of Liberty sitting in a wheelchair. A cake sits on the chair’s laptop tray. 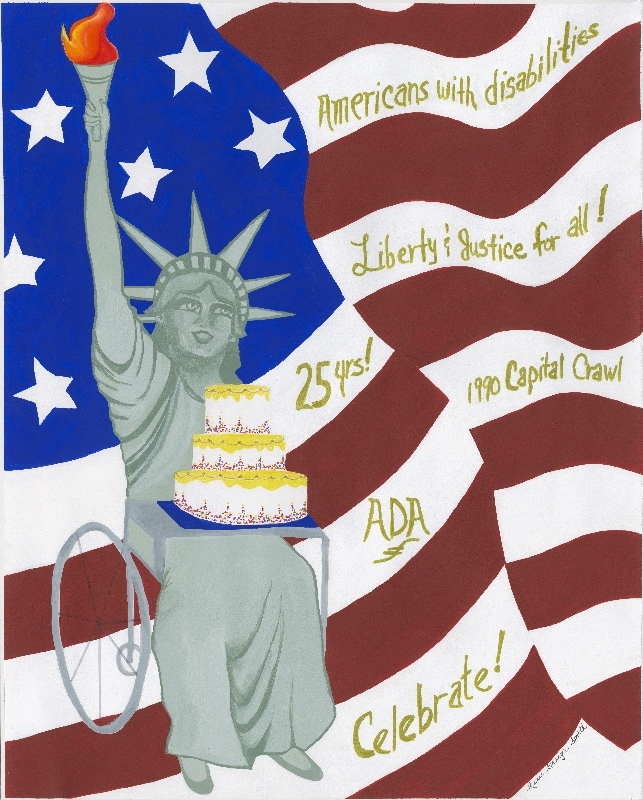 The background is an American flag with the following phrases written on it: “Americans with disabilities”, “Liberty & Justice for all!”, “25 yrs!”, “1990 Capital Crawl”, “ADA”. I believe art can greatly enhance life. My hope is that my art transcends and uplifts the viewer, to a place where there is beauty, renewal, and peace. Where the imagination is stirred and a new perspective can be found, perhaps suggesting a new way of thinking and shaking up preconceived notions. I am inspired by the natural beauty of nature, and its perpetual cycles of renewal. Deeply influenced by the world around me, I will often take a quick picture to capture, as an example, the way the setting sun hits an old brick building or maybe just the way a leaf is laying, creating a composition of its own. These are the images in my mind as I enter what I call my “creative flow”, where there is no time, no distractions, only the art. I use a variety of media, such as watercolor, pencil, ink, pastel or encaustic to create the language of color and the layers of depth and atmospheric light I want to convey. I am starting to incorporate photography as well. I consider myself a mixed-media artist. Inspired by the contemporary artists, Stephen Quiller, Calvin deRuyter, and Wolf Kahn, I like to push color intensities and explore various combinations, to create a more surreal, interesting image. My passion for music, interior design, fashion, and dance often find their way into my drawings of the human figure. Often what starts out as just a quick sketch, develops into a painting that starts to take on a life of its own. Song lyrics or quotes may start to come to me as I work and I will consciously choose to follow that creative spirit. When its story has been told, then I know the piece is finished. The result is a piece of art that has another layer to it, a more meaningful message below the surface. Every American will be touched by disability somehow in their lifetime. We are all in this together; and what is more unifying than the Statue of Liberty? Lady Liberty is smiling, because the America of today offers her a more dignified life. I read that 1 in 5 Americans will be touched by disability somehow in their lifetime. This made me realize that we are all in this together; and what is more unifying as Americans than the Statue of Liberty and our American Flag? My Lady Liberty is in a wheelchair, but she is smiling. She is smiling, celebrating the passage of the 1990 Americans with Disabilities Act, a bill introduced by Senator Tom Harkin. I wrote “Remember the 1990 Capitol Crawl” to bring awareness of activists, such as 8-year-old Jennifer Keelan, who left their wheelchairs and mobility devices at the base of the capitol steps and crawled up 83 stone steps to demonstrate what kinds of things people with disabilities have to face on a day-to-day basis. This Capitol Crawl is largely credited to the bill’s passage four months later. She is smiling because the America of today offers her a better life. A more dignified life. This work is funded in part by a grant from the Arts and Cultural Heritage Fund. The Minnesota Historical and Cultural Grants Program is made possible by the Arts and Cultural Heritage Fund through the vote of Minnesotans on November 4, 2008.